In 2010, Walmart (WMT) vowed to double its sales of locally grown produce by 2015. It was an attempt to both increase the amount of local foods in stores (as part of its environmental and sustainability initiatives) and invigorate local economies by supporting small farmers. Walmart has already blasted through its goal of selling 9 percent local produce -- 11 percent of the produce in stores now comes from farms near them. Yet despite Walmart's boast that this shift "saved customers over $1 billion on fresh fruits and vegetables," small farmers haven't benefited at all, according to a recent NPR report. Which raising an interesting question: Is that Walmart's fault, or is it the farmers choosing this path? 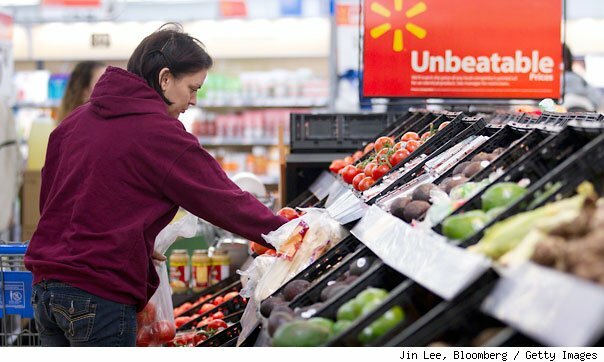 The problem from Walmart's perspective is that, as a low-price, high-volume business, it needs three things from its produce suppliers: cheap fruits and vegetables (to remain competitive), consistent products (so customers' expectations are always met), and high volume (to maintain quick turnover of products it sells). But these things are difficult -- if not impossible -- for small farmers to achieve. They have to charge higher prices to cover the costs of their operations (because they don't make up for it in large volume); they're limited to seasonal produce and are greatly affected by the weather; and their volume is much smaller than industrialized farming operations. So, in reality, a prime reason Walmart may not be sourcing more from small farms is because of the logistical hurdles it would present. One the other side of the equation, many small farmers are adamantly opposed to Walmart and refuse to do business with the world's largest retailer, regardless of any possible advances on Walmart's part. Alternative farming evangelist Joel Salatin bluntly declared in the 2008 documentary "Food," "I have no desire to be at Walmart." As he explained, because of Walmart's business model he would be forced to view his customers, his products, and his business completely differently to fuel the growth Walmart would demand. For him, maintaining the integrity of his small enterprise and the values he espouses is more important than whatever increase having Walmart as a client could bring to his business. Anecdotal evidence points to similar opinions holding true among many small farmers. I reached out via email to Ron McCormick, senior director of Local and Sustainable Sourcing at Walmart, to hear straight from the source what is going on. Unfortunately, his office hasn't yet responded to me. So I can only speculate. But, as with most things business, it's likely a combination of both factions. Walmart's size forces it to seek out only those partners who can achieve the high volume it needs. Small farmers prefer the direct in-person relationships they develop and nurture with their customers, which would be lost if Walmart were their middleman. In the end, the status quo is probably best for both sides: Walmart achieves its business agenda (though admittedly, not by helping small farmers), while small farmers maintain the integrity and relationships they hold most important. This article was written by Motley Fool analyst Adam J. Wiederman. Click here for a completely free copy of The Motley Fool's research report on two "cash kings" sticking it to Walmart.